Prevent transplant stress and grow strong, healthy plants from seeds using a technique called hardening to transition them to the garden. Growing plants from seeds is fun and economical, but rushing baby plants into the garden as soon as it's spring is a ticket to failure. Coddled seedlings, kept indoors under steady light and soothing temperatures, suddenly find themselves flailing about in high winds, pounded by relentless sun, and thirsting for a drink after a few hours. Moving seedlings into the garden without acclimating them can stunt their growth or even kill them. The solution is a simple process called hardening or hardening off plants, which helps them adjust their internal resources to deal with the external world they'll face in the garden. Plants grown from seed develop under constant, regulated, and perfect environmental conditions. Whether plants are grown on a sunny windowsill or under artificial lights, they never face the same conditions as they do outdoors. They develop fewer chloroplasts, the specialized cells that convert light into food; they are weaker than their outdoor cousins. In order to reduce transplant shock and help coddled seedlings transition into the outdoor garden, a process called hardening gradually exposes them to the natural environment, where fluctuating temperature, wind, and light stress even the hardiest plants. Hardening plants isn't difficult. Consistency and patience are the keys to proper hardening of plants. 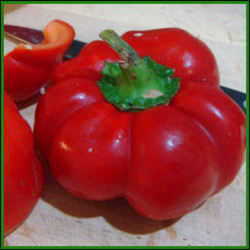 Start the hardening off process at least two weeks before you intend to plant the seedlings in the garden. In most areas, this is on or about the 'frost free' date for your gardening zone. This is the annual date of the last frost for your part of the world, but it may not be the exact frost-free date for a given year. Use this date to approximate the dates for starting, hardening and transplanting your seedlings. 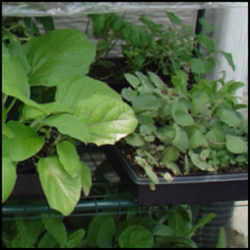 Seedlings should have at least two sets of leaves before hardening off. Choose a spot outdoors that's partially shaded; a deck, patio or spot near the driveway or walkway are perfect. Move the flats of seedlings outdoors during the day, and bring them indoors at night. Begin by moving them into a shady location and gradually move them into brighter and brighter light each day if you can. Don't let the seedlings dry out completely, but reduce the frequency of watering while hardening off plants. A cold frame is perfect for hardening off many types of seedlings. Be sure you prop open the glass lid of a cold frame during the day to prevent accidently "cooking" your seedlings. Cold frames in the spring can get very hot inside on warm days. Do not harden plants for more than two weeks. The process slows growth, but if continued to an extreme, it can stop growth entirely and weaken plants. Seedlings should be ready to transplant directly into the garden after the hardening process is done. 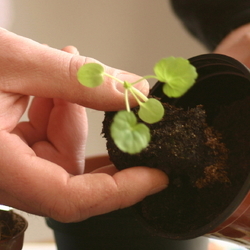 Transplant them on a shady day, in the early morning or late afternoon to prevent transplant stress. Use a spoon to dig tiny plants out of seed starting trays. If you accidently grew a clump of plants in one tiny cell of the tray, dig out the clump with your spoon and allow the seedlings to fall apart on their own once they're out of the tray. Grasp them gently and avoid damaging the roots. Plant each in its own container or spot in the garden. After transplanting, water your new seedlings well, and make sure they are well-watered until you see new growth. Avoid fertilizing them immediately after transplanting, as too much fertilizer can actually damage young, tender plants. Before putting away your seed starting trays for the season, take a few minutes to clean and sterilize them so they're ready for next year's garden. Rinse them outdoors, using a clean scrub brush to clear away dirt and debris. Soak empty trays in a solution of 1/4 cup of household bleach to 1 gallon of water for ten minutes, then remove and rinse thoroughly before storing them. In a few days or weeks after transplanting seedlings, you should notice a change in the young plants. The stems grow stronger. The leaves darken, taking on the green hue common among plants started outdoors. Soon, new sets of leaves emerge, and you're well on your way to a successful garden.